Surprisingly, my conversion from free-will, Arminian theology to Calvinism came rather swiftly. It’s shocking really, if you only understood the depths of hatred I once held toward those doctrines. (See Part 1 of this series for proof). I resisted initially, desperately hopeful that some sensible compromise existed between these diametrically opposed belief systems. I figured Arminianism fell into one ditch while Calvinism veered clear over to the other side of the road. I searched in vain for the imaginary highway that ran through the middle of both views, but of course I never found any signs to point the way. After wrangling with Calvinism for about 4 months, I finally beheld its beauty with a clarity only the Holy Spirit could grant. Almost exactly two years ago I was involved in a titanic spiritual battle between two opposing theological views. I could feel the once rock solid doctrines of Free Will slipping through my fingers like fine sand. I begged and beseeched the Lord to deliver me from the relentless reasonings and scriptural bombshells ripping the house I had built on the shifting dunes of man-centered doctrines. My pride and self-respect were on the line. See, for the first decade of my born-again life I embraced Arminianism. In other words, I believed that man’s free will is the deciding factor in salvation. Calvinism, which is the belief that God is sovereign over all things, including man’s salvation, had recently started making sense to me and I was drawn to it. (While at the same time being repulsed by it). Calvinism was a dirty word in my church. I considered it to be akin to the beliefs of Jehovah’s Witnesses, Mormons and liberal mainliners: Rank apostasy!! In my blindness I scoffed at the idea of a completely sovereign Lord who had the power over his clay to mold vessels of honor and of dishonor. From my limited exposure to Reformed soteriology I instead envisioned God towering over a huge golden lottery bin, filled with the names of every living person. I could see the holy angels rotating the bin by hand, mixing up the names so all participants in the game of life get at least a million-to-one chance to win the ultimate prize: everlasting life. I imagined the Lord reaching his hand inside, looking the other way (as to not show preference) and drawing out the lucky names at random. In my vision He then decrees these souls saved for all eternity. The angels rejoice and the Holy Spirit hurries down to earth to let those lucky few know they had hit the jackpot. Disappointingly, she offered no rebuttal, choosing instead to walk away quietly. Not surprisingly, she never spoke to me again. In retrospect, if she had vigorously defended her position with scriptures I may have come down this road much sooner than I did. Oh well. It wasn’t time, right? God is sovereign and he revealed this truth to me in his own time, in his own way. I am not complaining! 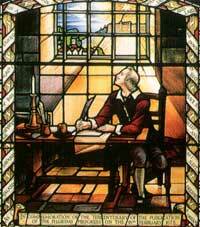 I have related the story of how my journey to the Reformed faith began here and here so I will not tread old ground. All I want to get across in this series is the why I crossed over to the dark side. God revealed the Doctrines of Grace to me and it has been a mighty humbling experience. I tremble at my presumption for saying I never would serve a God that was completely sovereign over his creation. I now truly understand his Lordship and I am eternally grateful that He has chosen me, not arbitrarily, but also not according to anything I have done. He chose me for his good pleasure and purpose. I am grateful beyond words that He has provided me with an advocate, Jesus Christ, who cleanses me of all sin; even blasphemy spoke in ignorance. Only by his grace and mercy am I now a new creation in Christ, called to do His good works which he has prepared for me in advance to accomplish. I cherish his sovereignty over me and am thankful that all things are done for His glory alone. In the next several posts I will reveal the main reasons I swallowed my pride and embraced the Doctrines of God’s Sovereign Grace.